Polycom are one of the world’s leading suppliers of video conferencing technology. Their solutions allow groups to communicate face-to-face naturally over distance resulting in highly productive meetings and faster decision making. For more information regarding the Polycom VC systems, contact our experts today. For people to be able to collaborate easily is so important for any organisation. Polycom video conferencing solutions extend your communications and integrates into your everyday workflow. Polycom systems integrate with Skype for Business / Microsoft Lync, SharePoint, Exchange and Office 365. Videonations are a Certified Partner of Polycom for video and infrastructure. We have supplied Polycom solutions to organisations all around the world helping to improve their business operations. Find out how easy it is to use Polycom® RealPresence® Group Series here. The Polycom Trio 8500™ is suitable for midsize conference rooms. Complete with Polycom’s legendary voice quality, you can rest assured that the audio quality is crystal clear. 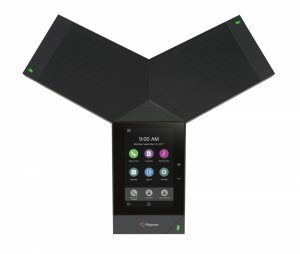 It eliminates any disruptive noise with Polycom’s patented NoiseBlock technology. It automatically detects non-speech noise and will mute the microphones for you, and will unmute automatically when speech is detected, allowing your meeting to continue seamlessly. With the Polycom Trio 8500, you can start conference calls on time with the modern, intuitive interface. With the broadest interoperability of any device in the marketplace, you are free to deploy on all leading voice platforms from SIP to Microsoft’s Skype for Business. With a sleek, sophisticated design, the 5-inch color touch screen and the intuitive Skype for Business interface makes navigation simple, resulting in fewer mistakes and quicker starts for every meeting with minimal training. The convenient, illuminated mute buttons on each leg allows everyone in the room to manage the meeting. Personal devices, wired or wireless, can be used via USB or Bluetooth for a full, rich sound through cloud conferencing services or to place calls using your personal contacts list. Working together with Microsoft, Polycom have designed the Polycom Trio 8500 to maximise the power of Skype for Business and Office 365. Extend the simplicity of Skype for Business from the desktop to the conference room – making it a consistent experience and ensuring broad user adoption. Contact our experts today for more information.